Today we had the morning off in Bangalore to catch up. This is the new Silicon Valley so I expected to have good internet here – and boy, was I glad since I had so much to catch up on. 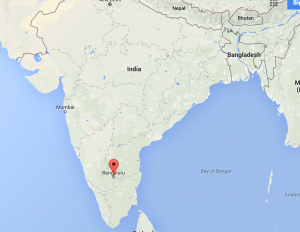 If someone in the USA gets “Bangalored” it means they lost their tech job to someone over here. 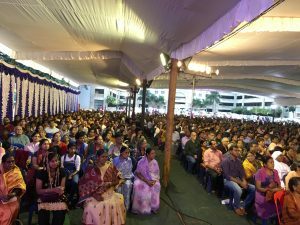 We drove an hour to St. Joseph’s School where they erected a huge tent for the evening to accommodate about 4,500 people. It filled up at 4:30 for Praise & Worship. Then Archbishop Bernard Maros arrived for Mass. Beautifully done with traditional Indian music. It is a great joy which often brings tears to my eyes to see the beauty of the Catholic Church around the whole world. 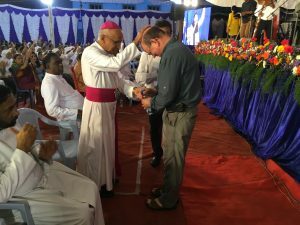 These devout Indian Christians come to praise Jesus, celebrate the Mass and hear a talk to inspire them to be better Christians. I love being Catholic! After Mass the Archbishop sat in the front row and they invited me up to speak. I started out with, “How many of YOU would like to be up here speaking with the Archbishop sitting right there in front of you?” He was so gracious and attentive. My talk was aimed at the vast exodus of Catholics out of the church for the hundreds of Protestant groups popping up all over the city. Some are small storefront operations while others are huge Assemblies of God churches with tens of thousands of members. Their pastor owns four homes and lives an opulent lifestyle. I explained that people were drawn out of the Church to these sects because of the attitude of “We love, love, love you!” but they also love your money. 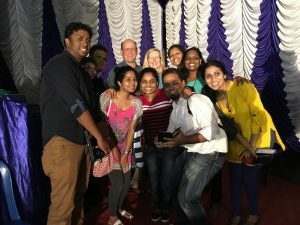 The talk was my “Conversion Story and Why Be Catholic!” I made a short video to share a small part of the enthusiastic and inspired Catholic in India. Enjoy! May God Bless you and keep you and may you continue to be a great blessing to the Catholic Church.